All components of our service delivery package are driven by three themes: proactive, longitudinal, and coordinated. Proactive means that we follow-up with women and children before they come to us. Longitudinal means we accompany families over time and use demographic, process level and outcomes data to improve our core program. Coordinated means we develop links across the health system and provide essential logistical support (e.g. transport) to facilities to reduce barriers to care-seeking. 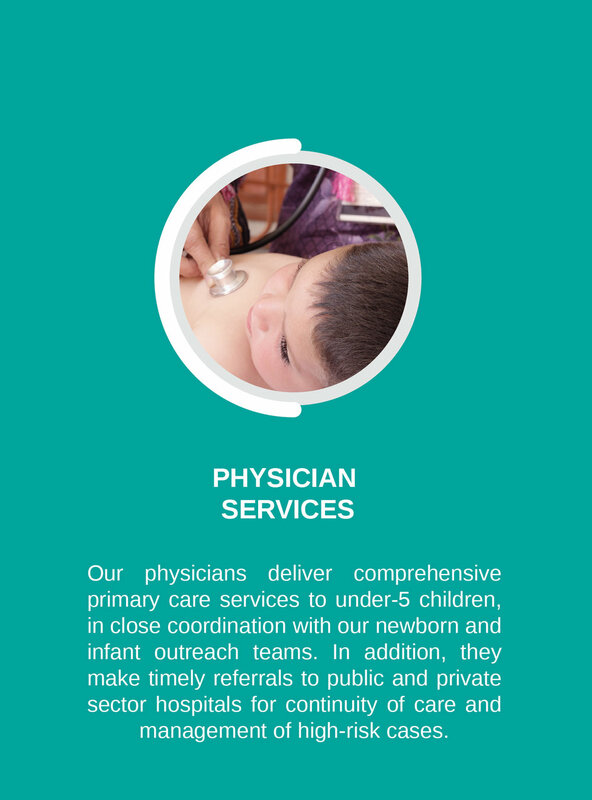 Our service delivery package spans across six areas that cover the full range of mother and child health services, starting from the early period of pregnancy all the way through to infant care. This ensures that mothers and children get essential preventive care as well as timely care at the onset of high-risk events. In addition, we also have a strong focus on reproductive health, which we believe is vital to improved mother and child health outcomes over time.